but will work in a space where curtain rods might not. And might be less expensive too. 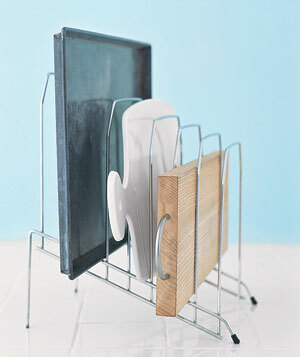 Especially if you happen to have an unused desk organizer sitting around gathering dust. 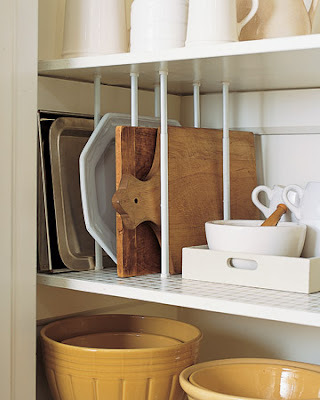 Do you have a cupboard divider? What do you use? I need this. I have lots of space, but I can't seem to figure it out. Maybe this will work. Thanks for the tip! I use a cupboard divider that looks a lot like the office organizer, but it isn't elevated in the back. It is at all big box stores in the kitchen section. The office organizer would work if you had one on hand, but the one for the kitchen takes up less vertical space and be a bit more sturdy.